Diamond Aircraft Receives FAA Certification For Austro Engine AE300 Powerplant! FAA has issued Type Certificate E00081EN for Diamond Aircraft's proprietary Austro Engine AE300. The jet-fuel burning 170 hp turbo-diesel piston engine represents a new generation of aviation powerplants, offering pilot workload reducing single lever thrust control, electronic engine management and monitoring, and superb fuel efficiency, with independence from leaded fuels. 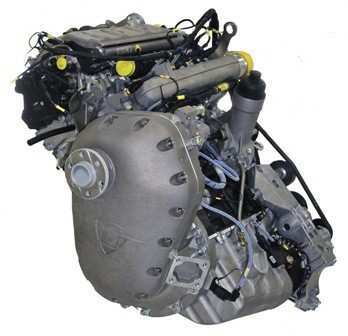 The engine, developed by Austro Engine in collaboration with MB Technology GmbH (Mercedes Benz) and Bosch General Aviation Technology GmbH, features the very latest in high pressure common rail fuel injection technology, offering even better specific fuel consumption than the first generation turbo-diesel engines originally used by Diamond. With more than 2,000,000 accumulated flight hours in the turbo-diesel powered Diamond Aircraft fleet, Diamond is the most experienced airplane manufacturer with regard to turbo-diesel piston engine operation. This experience has benefitted the development of the Austro Engine, with features such as a FADEC controlled actuator driving a conventional constant speed propeller governor, a high mounted turbocharger to permit gravity oil return, a torsional vibration absorber in place of a wearing clutch, robust military style electrical harnesses and connectors, heavy duty reduction gearbox, 4-point engine mount and countless detail features to ensure reliability, and reduced maintenance costs. The engine produces 170 hp and is capable of producing 100% power at 11,800' density altitude, offering significantly improved performance over the previously installed TAE 135 hp engine. Diamond is exhibiting the AE300 powered twin DA42 NG at AirVenture 2009. The display aircraft flew from Diamond's Austrian facility, averaging a fuel burn of only 5.6 gph per engine, at 65% power and 155 ktas at FL140. The combination of low fuel burn, independence from leaded fuel and low noise emission, makes the AE300 the most environmentally friendly piston engine available. The ability to operate on globally available Jet-fuel makes the AE300 particularly suitable for strategic applications and markets where AVGAS 100LL is either very expensive or has limited availability. The FAA certification of the AE300 paves the way for FAA validation of the EASA Type Certificate for the DA42 NG. FAA validation is expected late Q3, 2009. Installation of the new AE300 engines in earlier DA42-tdi aircraft is possible and available from Diamond Aircraft.